About a week ago, I was sitting at home on a Tuesday evening with nothing to do. I had already watched my usual shows being: Dancing with the Stars and American Idol. So it was 10pm and I was roaming the channels. 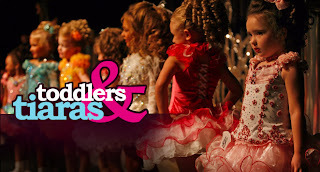 I came across a show on TLC called Toddlers & Tiaras. First of all...Oh.My.God! It was like a bad car wreck you just couldn't look away from. I couldn't stop watching. I felt horrible for some of these kids. CLEARLY some of them did NOT want to be there. It was clear the mothers had a major hand in their children being there. I have no problem with the natural girl pageants. However..the "glitz" pageants...NO! This is where they have them wear fake hair pieces, false eye lashes, fake teeth, spray tans. Who spray tans a 5 year old?!?!?! These moms need mental help. I can tell most of them were overweight kids who never did pageants and clearly wanted to. Now, don't get me wrong I have no problem with pageants but there's always a line and in this show it was clearly getting crossed. I think these moms are batshit crazy and cannot even imagine how many issues those poor kids are going to have!! I havent' seen the show, but I feel sorry for those kids. Their moms seem totally insane to me. I mean spray tanning your little girl?! INSANE! I watched the show the other day too and I was sickened by what I saw. I can NOT believe that these women would want their kids to grow up so fast. Whatever happened to kids being kids and having fun? Ugh! I have to agree with everyone else! I watch this show and think "that is what I don't want to be" when I am a parent. You think a five year old really loves practicing 3 hours a day??!! I think the weirdest thing about this show is that it comes on after 18 kids and counting...hello, could these 2 worlds be any different from each other? I think this is just SICK SICK SICK!!!! uggg I HATE that show! I just don't get why a mother would think it's ok to do that to her kid! I think CPS should go to all of them and interview parents. Was reading thru more of your blog... so this comment is a little behind the times. These mom's scare the h-e-doublehockey sticks out of me. Disturbing is being kind.